Osa Leighty, a Chanute native, was only 16 when she married Martin Johnson and took off to see the world. Martin and Osa were the first to send back film and photos from Borneo and Africa. They lived at a base camp in Africa off and on for several years. When back in the U.S., they were in great demand to promote their films and lecture about their travels. The Johnsons are a touching love story as well as a fascinating life story. Find out more and relive their adventures at the Martin and Osa Johnson Safari Museum located in the historic Santa Fe Depot in Chanute, KS. Martin and Osa Johnson were selected as one of the 8 Wonders of Kansas - People by the Kansas Sampler Foundation. 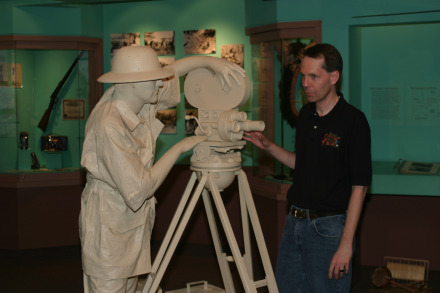 The Martin and Osa Johnson Safari Museum is open from 10 a.m. - 5 p.m. Monday - Saturday and 1 - 5 p.m. Sunday. For more information, www.safarimuseum.org.